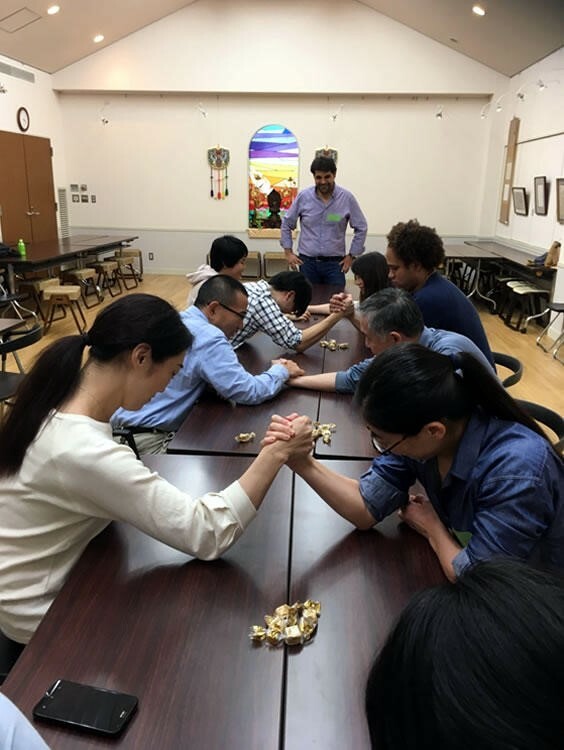 During his last visit to Japan, Aree, the director of our Iraq partner organization “INSAN”, held many events including two nonviolence-training workshops with JVC. 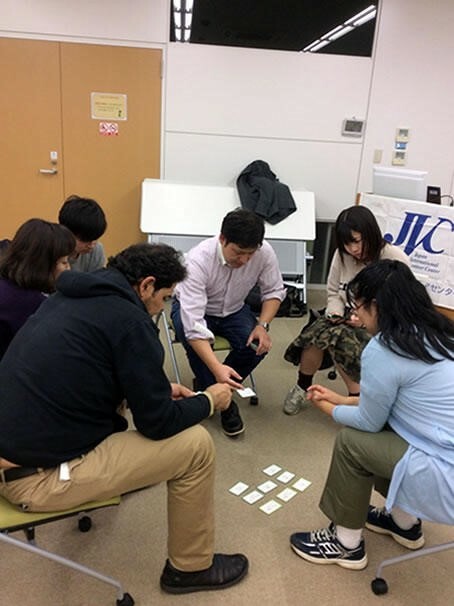 Nonviolence workshops have become a JVC-Iraq project annual tradition, during the Iraq staffs yearly visit to Japan. 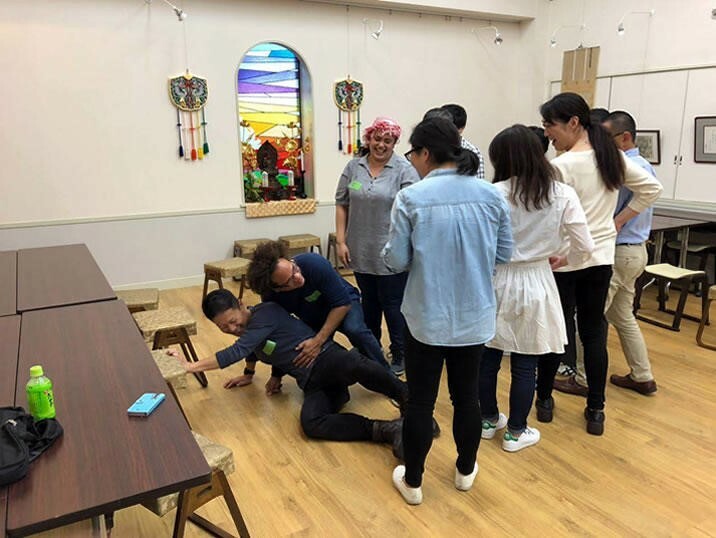 We hold these workshops to be a learning tool for the team but also to draw the attention of the Japanese public to various forms of violence that are being practiced unknowingly in daily lives and ways to avoid these kinds of violent tendencies that we all might have. In principle, most of us believe in cooperation, nonviolence, and acceptance of others. However, when we put these believes to test; usually, our physical reactions do not agree with our mental images. That is where nonviolence training plays the role of matching physical responses to moral values. A nonviolence approach, whether in our daily lives or conflict zones, gives people the ability to change conflict based on differences in needs and desires into creative energy for development instead of being a source of chaos and violence. In 2018 we held our annual workshop in Niigata city with the cooperation of the Center for Peace Studies of Niigata (CPSN) and the Niigata Volunteer center (NVC), alongside Prof. Hiroshi Sasaki, from CPSN, who facilitated it. Along with the familiar faces that we have the privilege to meet every year, and our very loyal volunteers, we have new participants most notably the two ladies who have come all the way from Tsubame city. The most exciting thing that happened during the workshop was when Ms. Yokoyama from CPSN introduced the Japanese kids game, Gomu Tobi, to Aree and me, and we told her that the same game is also popular in Syria and Iraq among young girls. Then Ms. Yokoyama explained that it is more popular with young girls than boys in Japan too. She explained that she introduced the game because it is a game in which kids take turns to perform tasks without assigning winners or losers, and in this game, kids encourage each other to complete a task which requires a lot of physical coordination. 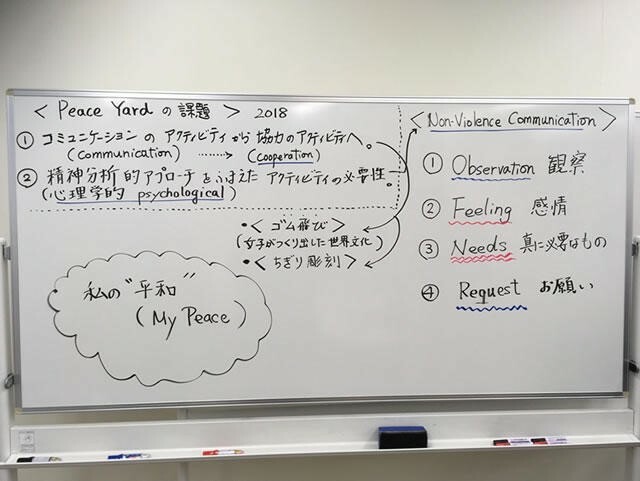 The Niigata workshop was focused on creating activities that can be applied during the Peace Yard activity in Iraq, in which children are encouraged to cooperate and work together. 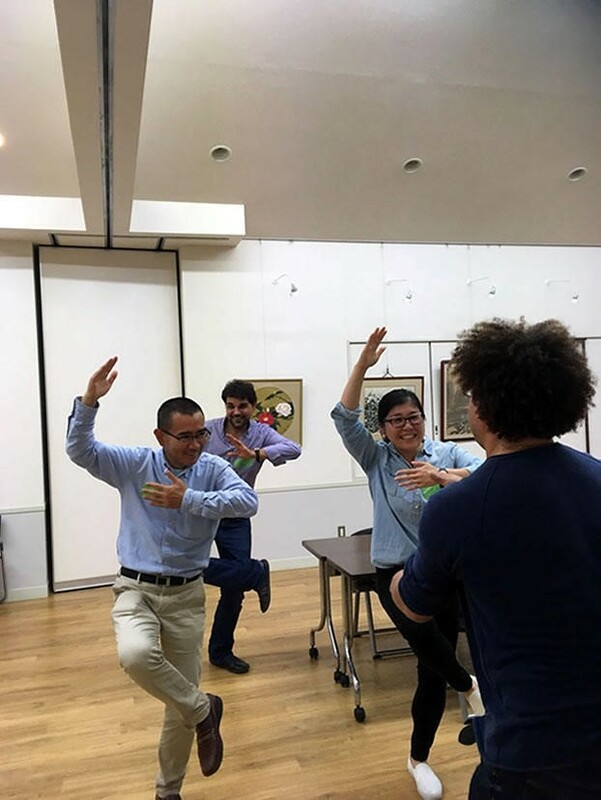 We held the other workshop in Tenkoin- temple in Tokyo, and it was titled the “Essence of Dialogue: Communication through nonviolence training”. As the title suggests, it was about communication, however that communication was taking place without using language and words. Being able to communicate without using words is very important especially when people cannot speak the same language, like in Iraq, where some people speak the Kurdish language, and others speak Arabic or other languages. Also, communication with people with a different language is essential for communicating with the increasing number of foreigners in Japan, and of course it is crucial for international cooperation. The workshop had mainly Japanese participants, but also some foreigners participated including Aree and me. It was held in both English and Japanese simultaneously. Despite the small number of attendees, the workshop was very lively and exciting. In this workshop, Aree facilitated the session with the previous Iraq project officer, Miki Ikeda. The workshop focused on activities done by Iraqi children in Peace Yard to communicate despite the language barrier. We received great feedback from the participants, and after the session, we had a lot of fun silly photos of everyone including Imai, the president of JVC. Nonviolence workshops are a fundamental pillar of JVC Iraq project activities. It is an essential link between INSAN staff and the Japanese public. It is also our way of giving back to the Japanese community for all its support by sharing skills, information, and a fun time.